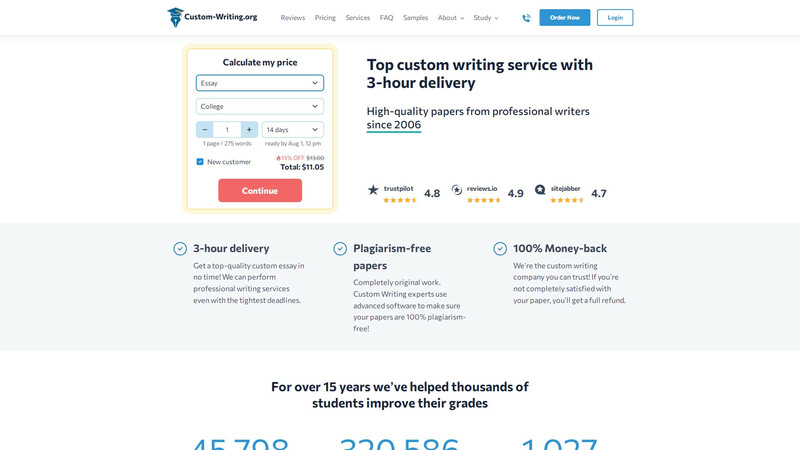 The landing page of Custom-Writing.org is divided into 3 sections which make it difficult to understand - all the services they offer (which are fairly extensive) are condensed into this single page. Searching for the most important service, which is customer support, is especially difficult. Pricing details can be found on a separate page. The heading for the prices is very small and is not highlighted, which make it difficult to locate. The cheapest product is High School level paper done within 14 days - $17.31. 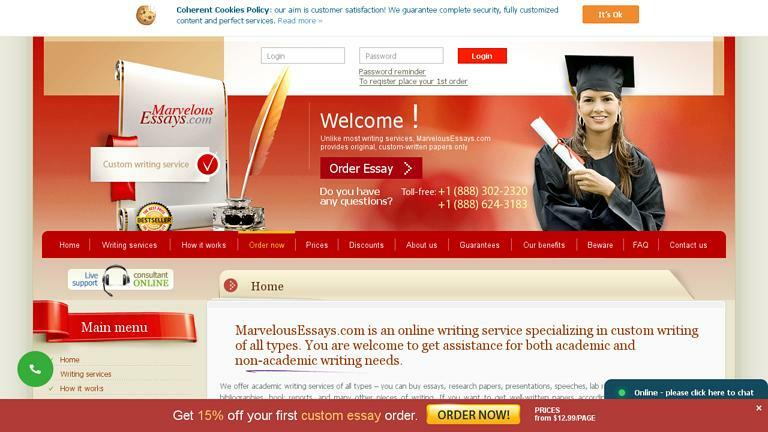 The price for a 12 hours deadline paper of Master’s level is $39.89 per page that is approximately 300 words. 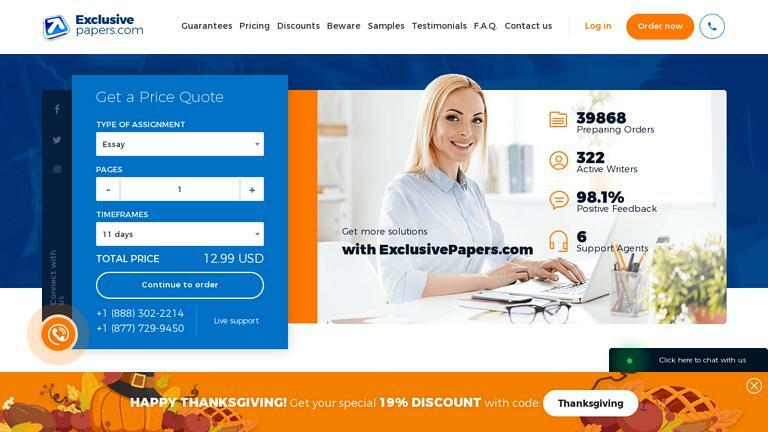 Moreover, the discount packages offered are not as good as competitor site. They claim that repeat customers can get better discounts, but the operator did not give us a better price when we asked. For complaints and support services, they have a 24/7 hotline number, chat system, and emailing support system. However, all three services failed. Operators of the landlines are very busy and this affects the way they handle complaints. They seem to be very busy and didn’t give us the attention we felt our case deserved. There were no writers available for chat. This could have been a good venue for last minute instructions and modifications, but if no one is online, it’s pointless in having this feature. We were very specific regarding the revisions that we wanted them to work on using the last resort through email, but they failed to address the points we made properly. To summarize, we felt the quality was very poor. To test their claims that they can produce high quality university papers, we ordered a ten page dissertation in a very challenging subject. What they delivered was something more akin to a high school paper - sentence construction was very poor and the word choice was at a High School level. The process of ordering papers is quite complex. The registration process was very slow, and the form was quite confusing, asking for repeat information time and time again. Very frustrating! Several payment options were offered but the payment processing was also slow, just like their writing services. Overall, Custom-Writing.org is a major failure. Their website is bland and the information is too compressed which leaves customers bewildered. The quality of work was nowhere near as good as the samples they posted on their site, definitely not worth the higher than average rates they charge. More importantly, their customer service is dysfunctional at best. They don’t even know the importance of beating the deadline because they are so lax. Important points for revisions are never properly addressed which adds to the general bad feeling. I've just got my paper and the paper quite good written. I even can't expect that it is going to be such quality, but the delivery was not so fast as I expected. This paper is really bad. Full of punctuation mistakes, wordy sentences, and incorrect MLA citation. The writer did not read the provided instruction at all. I am very disappointed. Your services cost me an arm and a leg. Doubt that it was ok to pay so much for the worst experience. If I knew that the services are at a low level of quality, I wouldn't be ordered it. 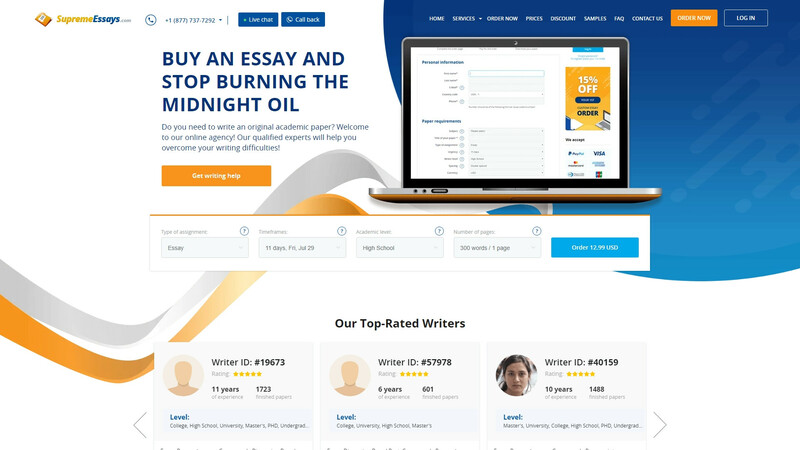 I have already ordered an essay on this site for the first time and it was awful. For the second time I hoped an essay will be better, but it was bad again. This writer completely misunderstood the instruction and as a result, I got completely another paper. It was totally wrong and I had to rewrite it by myself. I asked for a refund. I see no reason to pay the ridiculously expensive price for a writing service that invests in a fancy website that has a lot of bells and whistles. Especially when your company doesn't ensure quality. Too bad. The support manager didn't sound welcoming. It felt like every time I called, he asked "omg, it's you again. Stop calling, what's your problem this time?" 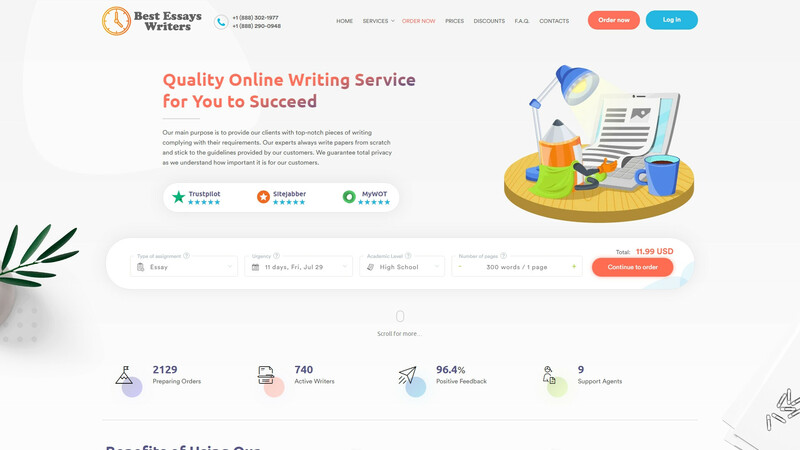 Maybe, I would recommend this service for editing work or something, but not for paper writing as it wasn't good. I've recently ordered a research paper in Philosophy from Custom-Writing.org, and although the topic was quite complicated, I recieved B, it's not an excellent mark but still good, 'cause it was a really hard topic for me.